Manuele Atzeni a.k.a. Miyazaki is a dj/producer from the underground music scene in Florence, Italy. Born as a hard-techno dj, since 2001 he has been spinning and scratching in parties, clubs and festivals around Italy mixing hip hop, funk and drum ‘n bass. In 2008, along with Johnnyboy, he formed “Overknights”, an independent dj and beat-producing duo based in Florence recently evolving to include other talents from their local scene, like Millelemmi, Digi G’alessio (A.S.F.T.) and Biga (Ether). Manuele Atzeni’s music is heavily hip hop/electro influenced with a strong jazz/funk taste. 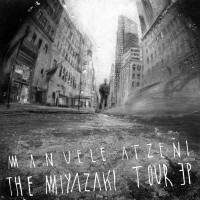 The Miyazaki Tour EP by Manuele Atzeni is licensed under a Creative Commons Attribution-Noncommercial-Share Alike 3.0 Netherlands License.